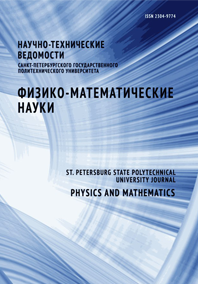 Platko Anastasiya P. Sotova Yulia I. Gorokhovatskiy Yuriy A. Karulina Elena A. Galikhanov Mansour F.
In the paper, the results of studies in the charge relaxation mechanism in polylactide films with nanoscale hydrophilic filler (magnesia) have been obtained using thermally stimulated depolarization current (TSDC) and thermally stimulated surface-potential decay (TSSPD) methods. The loading of the hydrophilic filler (magnesia) was shown to result in the polymer conductance reduction, i.e., in the improvement of the electret properties of the composite. The optimal content of magnesia (4%) responsible for the highest electret state stability in polylactide films was determined. The values of the effective frequency factor and the activation energy of the deep traps for the injected charge being inherent to the polymer matrix were estimated by regularization technique. The obtained results demonstrate the capability of making active (long time retaining the organoleptic properties of the products) and biodegradable (solving the problem of recycling) packaging materials based on composite polylactide films with magnesia as a filler.